The Caroni Bird Sanctuary is an official wildlife reserve in Trinidad and Tobago and is part of what is more commonly called the Caroni Swamp. The swamp is a relatively large wetland in the west of the island of Trinidad, roughly between Port of Spain and Chaguanas. There may be some who might believe that Caroni is “South” Trinidad, but if you look at the map, it’s in the Northern half of the island. Those of us from south of the Churchill-Roosevelt Highway* tend to regard Caroni as Central Trinidad – even though much of it is decidedly North. But enough of my pet-peeve regarding Trini geography. 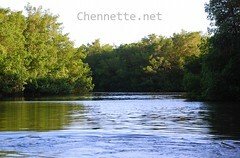 The Caroni Swamp is essentially the wetland formed where the Caroni River meets the Gulf of Paria. Caroni River is the largest** in Trinidad and is most famous for floods. There is another Swamp in Trinidad, which is the Nariva Swamp on the East Coast of the island. That’s the place where it’s rumoured to still be home to manatees. Visitors to the Caroni Swamp sit on slow-moving boats with (hopefully) informative tour guides, through the mangrove-lined waterways, keeping an eye out for caimans, mudskippers, herons be they blue or white, boas, large iguanas, mangrove crabs and oysters and of course the star of the show, the Scarlet Ibis. The Scarlet Ibis is one of the national birds of T&T (more or less representing Trinidad, while the Cocrico represents Tobago). The Scarlet Ibis, the Cocrico and the Humming Bird are all represented on our Coat of Arms. The Scarlet Ibis (Eudocimus ruber) is a species of ibis that inhabits tropical South America and also Trinidad and Tobago…Adults are 56–61 cm long and weigh 650g. They are completely scarlet, except for the black wing tips. They nest in trees, laying two to four eggs. Their diet is frogs, reptiles and crustaceans. A juvenile Scarlet Ibis is grey and white; as it grows the ingestion of red crabs in the tropical swamps gradually produces the characteristic scarlet plumage. The life span of Scarlet Ibis is approximately 15 years in the wild and 20 years in captivity. 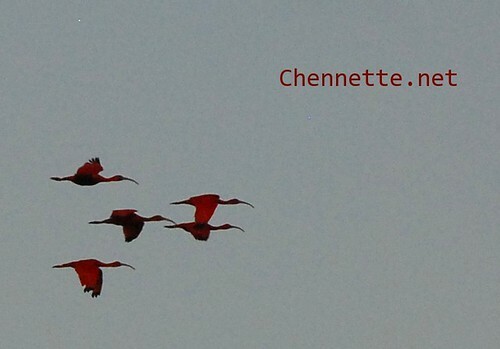 The Scarlet Ibises nest in the Caroni Swamp, and late evening is the best time to see them returning to roost, filling the mangrove clump of choice with red splashes of colour, rather like a humungous hibiscus bush. 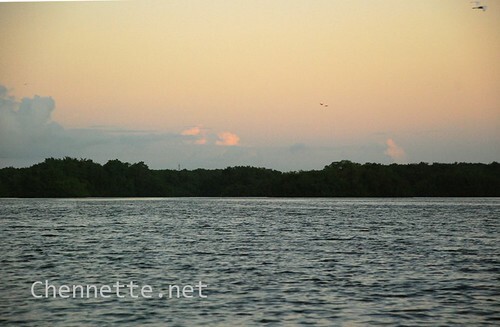 The White Ibises also roost there, in the same mangroves but they’re not the main draw. There are several private tour companies that can give you a boat tour of the Caroni Swamp – Nanan’s is usually recognised as the oldest, but there are others which you can find listed on the official T&T Tourism Site. I can only speak about Nanan’s. They have a website and email address, although I found that they only answered my emails after I called them…Cost per adult is US $10 or TT $60. Children 12 and under are half price. Residents get a special discounted rate of TT $50. They seemed really friendly and they have many boats so they can almost always fit you in even last minute, and even if you turn up late (they use a smaller boat to ferry you up to the rest of the tour). However, their boat-drivers aren’t necessarily the best tour guides. Our guide had been trained, but it seemed clear he was reciting from a script. He had to be prompted to provide any other information, and in fact our first 20 minutes of the tour we didn’t hear from him at all, even when we stopped to see the caiman, the mudskippers or heron. It was odd. Fortunately I was with friends – the visitors from the US as well as a couple good friends I’ve known since I was 10 or 11 (not saying how long ago that was). Good company can trump strange service any time Especially when we’re willing to provide our own commentary and information. That being said, I love being on boats – it’s calming. And the gentle ride of a boat tour through a Swamp is particularly so. Throw in the fact that you get to see wildlife, get great views and a lovely sunset…what more could you want? * This is the highway that runs from Port of Spain in the West to the East of Trinidad. This entry was written by Chennette and posted on January 15, 2011 at 9:00 am and filed under photos, travel, Trinidad and Tobago. Bookmark the permalink. Follow any comments here with the RSS feed for this post. Post a comment or leave a trackback: Trackback URL. There is so much to see and do in Trinidad; the view of the Scarlet Ibis on the foliage of the Caroni remains a vivid spectacle. 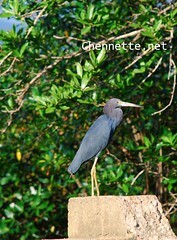 Your blog is a nice reminder of the beauty that inhabits our islands…. Nice (if not generous) write up! 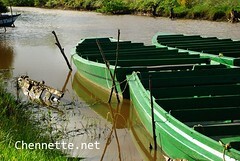 I like the green boat pic. Saw any alligators (Caimans)? 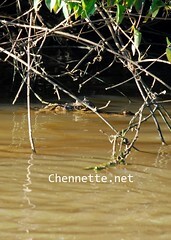 in the last row of photos – next to the Blue Heron – that’s the only caiman we saw, small one, staring at us early on in the boat ride. thanks Wizzy! and it was a seriously whirlwind thing – I had to wait anxiously for meetings to end, run back to Trinidad in time to meet my friends from the US show them around and race back to work.